The original Far Cry’s name has all but been run into the mud. From the well received PC original the formula has been diluted to within an inch of its life on the home consoles, with the final Wii version being barely recognisable compared to its forerunners. True, it was still somewhere sunny, but little that had made the series an initial success was visible in its tale of mutant powers and waggling. Removing themselves away from the tropical island setting, Ubisoft have attempted to reboot the series by placing you in the shoes of an international agent tasked with tracking down an arms dealer known as The Jackal. Based in Africa, The Jackal has been supplying both sides in a bloody civil war and has left a trail of destruction across the whole continent. An early run in with him leaves you running for your life, eventually being dragged to safety by one of the local militia. After recovering, they give you a gun, a car and a mission and you are set on the way for revenge somewhere on the other side of the map. And that is Far Cry 2 in a nutshell: a series of missions, setup by dubious characters, with mostly suspect aims, that require you to drive great distance to shoot someone for someone else. Whilst the plot may not win awards for originality, it does offer an excuse to take the adventure through various African inspired environments. The scope of your world is huge, taking almost twenty minutes to drive from one edge to the other, and the trail leads through lush forests, grassy plains and harsh ravines, each offering more than a change of scenery. Combat in a forest offers the ability to sneak through the undergrowth, applying Rombo-like skills to take down mercenaries, whereas the dry, grassy plains are far more susceptible to bush fires, meaning a well placed Molotov can make short work of adversaries. You need to be adept, too, as if ever there was a game that would, if it could, make you eat worms, it is Far Cry 2. Nobody in this game likes you, in fact everybody pretty much hates you. If the person you meet is not behind a shop’s counter then it’s a sure fire bet they will either try and ram you off the road or draw a gun in your general direction. Roads have checkpoints at regular intervals stocked with resistance and even on long, empty stretches a jeep with a mounted gun is a common sight. Gunplay is good, although a little floaty, and is let down by weapons developing the tendency to jam at crucial points the more you use them. As amusing as this sound, when I burst around a corner to take down a man who has been waving a shotgun at me then I expect to hear more than a “click” followed by him releasing both barrels into my chest. I do believe it is an interesting mechanic and one that could be explored but there is no indication as to how likely any individual weapon is likely to exhibit this frustrating habit. Supposedly it is how battered and weather beaten a gun is but as they all seemingly start out as default shade of brown its not entirely clear. Second on my list of annoyances is the onset of malaria episodes. Again, at random, you can succumb to a bout of dizziness where you vision is blurred and defending yourself is out of the question. It’s place in the game seems only to serve as a conversation starter for NPCs who generally tell you that you don’t look well. 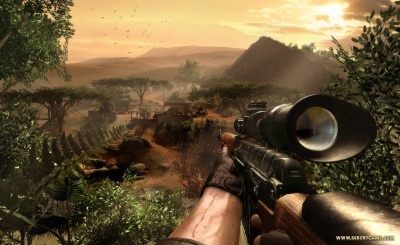 Overall, though, the game does produce a proper African adventure. At times you can travel for miles through the country’s criss-crossing road system and although you may wish for a fast transport system ala Fallout, I can think of a lot worse ways to get around. The scenery is interesting and the chance that you could stumble upon a stash of diamonds means you have as much attention focused on your GPS as you do the road. Like so many sandbox games, Far Cry is more than the sum of its parts. The missions may be simple, the handling average and the random quirks irritating, but the ability to jump into a jeep and drive around the Serengeti in search of riches and bad guys is a powerful counterpoint. The origins of the original Death Tank are that of a pack-in game found in a pair of mid-nineties Saturn games. Rather than face the world alone it shuffled into being cowering behind Duke Nukem. Nothing has really changed with the release of a new Xbox Live Arcade version. You still have a two-dimensional hilly environment, you still have to blow opponent’s tanks to kingdom come and it still doesn’t warrant being a stand-alone title. Even those players who missed Death Tank’s original outings will probably be familiar with the style of play. 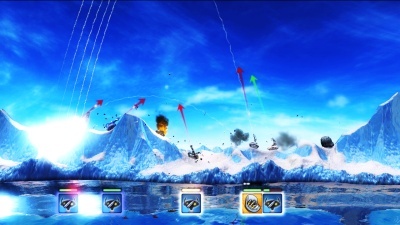 It is basically a real-time version of Worms, where the trajectories and power for your projectiles must be set with the analogue sticks before launching a weapon. It’s a game of angles and experimentation, mostly, although you can upgrade your weapons to mix things up. The real-time element does add a sense of panic to proceedings, as you constantly attempt to juggle dodging bullets with maintaining your angles to score hits in return. Upgrades add on boosters to allow you tank to fly around the screen, shields that can be pulled up in an emergency and cluster bombs to rain down destruction, but no matter how hard it tries it just doesn’t possess any charm that makes me want to keep playing. The bottom line is that Death Tank is ridiculously overpriced at 1,200 MSP (roughly £10 and a 50% markup on the average arcade game) as it is no more than a simple flash game with delusions of grandeur. The actual concept is quite fun, but I got a very similar game to this built in to Q-Basic back in 1993 that was just as enjoyable. No matter how many power-ups or flashy graphics that are laden atop this remake, none can justify its cost. 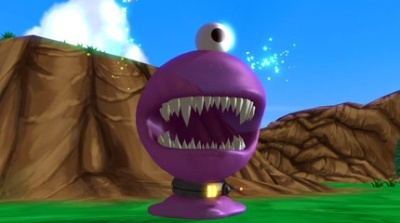 Instead can I direct you to Worms, a vastly superior game for only one-third the price. 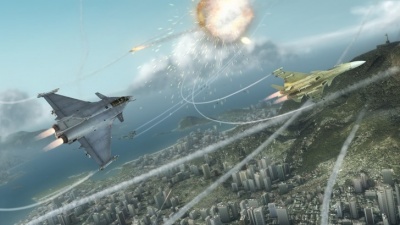 Flight combat games are very much a Marmite of the gaming world. For as many people as I know willing to don a jumpsuit, nestle into a cockpit and start shouting “Gooooooose!”, there are an equal number quite happy to walk on by and wait for something that doesn’t involve quite as many aerofoils. Tom Clancy’s “High Altitude Warfare – Experimental Squadron”, aka HAWX, is Ubisoft’s new addition to this skies. Quite how it fits into the Tom Clancy branding is anyone’s guess, but there is something reassuring about the possibility that you could swoop in and provide air support for the Ghost Recon or Rainbow Six team at some point during your mission. The core of the game seems a standard affair with your squadron has been tasked with repelling an enemy invasion. There are enemy fighters to dogfight with, bombers to dispatch before they lay waste to the population and ground bound tanks that allow you to skim low over the landscape’s geometry. It’s fair to say that if you’ve played any flight combat game before you won’t be surprised with the scenario presented in the demo, but I suppose its hard for fighter jets to do anything else. One of the major issues cited by those who dislike aerial combat is that it always end up in the same routine where you and your target merely end circling each other in a hopeless bid to get a lock on. Thankfully, the most welcome feature in HAWX gives you in game help on how to avoid this situation. In the right situation, a dab of a button will bring up a series of markers that indicate where you should fly to get the upper hand. Their presence doesn’t mean that a lock on is a formality, you still have to have the skill to fly through a jinking set of waypoints and paying attention to the motions can prove far more beneficial than any scripted tutorial. The planes do handle nicely, though, so controls shouldn’t hamper you here. The same applies when an enemy’s missile is speeding towards you. The same waypoints can be pulled up to show you the best way to evade your pursuers and stay in the air. There is one very, very bad point about HAWX, however. Something that I cannot believe got past any point of the design or testing process, and that is the way you are forced to fly the tutorial in a distant, third-person camera that suffers from attention deficit disorder. I cannot stress enough how bad this camera is as it is placed 500m behind your plane and never stays still. There are times when I have been flying towards it unable to see where I a heading; there are times when you are unable to tell the proximity of enemies to you; there are times when it swings wildly as you make a sharp turn, altering the relativity of your sticks at the same time and turning your loop the loop into a banked turn. It is just plain awful and if anything it has to be seen to be believed. It astounds me how it is forced upon you in the tutorial of all things. I wouldn’t be surprised that if presented with a camera of that quality that players are unwilling to complete the demo, let alone buy the full game. The constant thought in my head was “what if I am forced to do a full mission like this?” It’s enough to put you off entirely. That aside, as thankfully in the demo mission you can choose your cockpit view, HAWX is a competent game. It’s not going to change anyone’s opinions on the genre for the better, but it does add a couple of interesting features in an attempt to trump last year’s Ace Combat. My first impressions of Hawx will have to wait. Many of you saw the news yesterday and I would personally like to say thank you for all your kind words of support. Whether it be through text, email, Facebook, Twitter, carrier pudgeon or semaphore, they were all appreciated. As you’d probably expect, I’m not going to say anything else on the topic at the moment but consider my fingers crossed for a positive outcome. 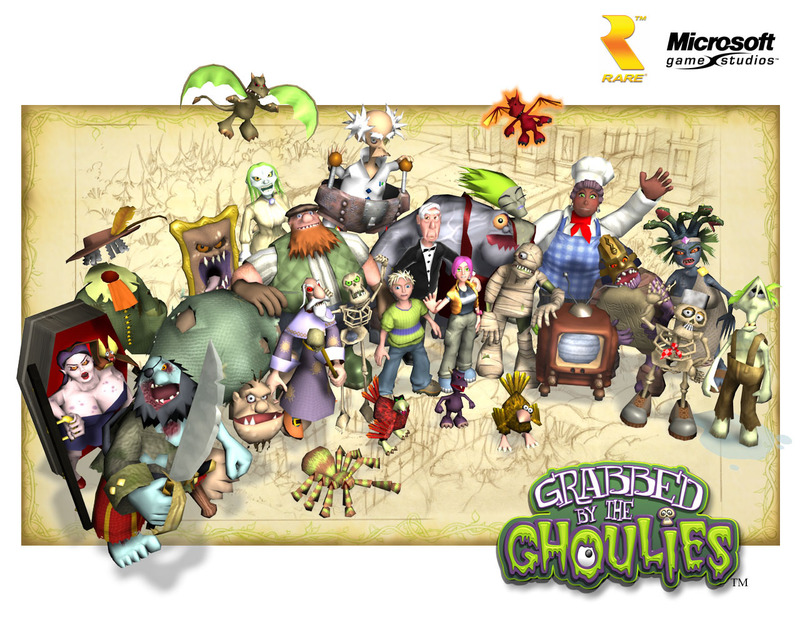 Memory lane continues to throw up surprises as what is this I see nestling amongst the Xbox Originals on Marketplace? Why it appears to be Grabbed by the Ghoulies. Whilst not universally loved, it does hold a very soft spot in my heart as it was the first game I ever worked on, if you exclude that Visual Basic version of Monopoly I tried at college. When we heard that Ghoulies was heading to Marketplace, I decided to revisit Ghoulhaven Hall and its inhabitants and I have to say at how shocked I was to see how well the visuals stand up. Obviously the polygon count is a little low by today’s standard but the cartoony style that our artists used have really helped it stand the test of time. The casts’ animations, the detailed environments and the character of the whole game is what I believe is its greatest strength. Anyway, I’m just proud and happy that our Ghoulies are once again available to the public. Tonight, I continue my trip down games of my past, but this time it’s one that I haven’t played for fourteen years and doesn’t involve a joypad. Some time ago, I mentioned in passing to a friend that I was interested in painting figures once more. I used to find it incredibly satisfying and working on the models for Believa had rekindled that. Lo and behold, come Christmas the very generous Littlest Kobold gave me a Warhammer 40,000 starter kit with more models that you could shake a scaled sprue at. I was extremely pleased and very soon the kitchen table had been taken over, covered in newspaper and converted into my painting bay. It was at this point, however, that a series of strange coincidences happened. All over Rare the same thing was occurring; out of the blue, Schizofen received the same starter set and Pirate Steve, also looking for something to paint, happened to raid the Space Marine section of his local Hobbycraft. It was only after we all returned from our Christmas break with the telltale signs of Citedael paint on our fingers that we realised what had happened and how fate, it seemed, had decided it was time for us to once again battle with dice and small plastic figures. So tonight my White Scars ride into battle against the Black Templars. Over the last few weeks I have enjoyed painting my mini army. After pulling down from the loft my previous efforts of over a decade ago I am shocked at what I thought was “good” back then, and although they may not be Golden Demon standard I a far happier with how I hold a paintbrush now. All this goes to show is that must be very few, if any, places that are geekier to work in. I’ve spoken before how in the last six years Rare has made me roll more dice and play more card games than I ever thought possible but somehow it still manages to surprises me. Fads spread like wildfire through its corridors and whilst there are some with stouter wills than my own, there are more than enough of us to succumb and enjoy the virtues of social gaming and the plethora of dice that come along with it. Hardly any gaming has been had over the weekend as housework and DIY have taken precedence. The sheer volume of stuff that I had to cart back from my office meant an emergency trip to Ikea to deck out my office back at home. I’m quite proud of the results, though, as I now have a good portion of my gaming collection accessible. They sit above my graphic novels and boxes and every time I walk into the room I have a browse to see what I should dabble in. All I need now is a monitor that accepts composite inputs so I can hook up my old consoles down there, too. The one problem case was my N64 cartridges. Thanks to Gamestation’s fire sale a while back I have 56 of them and due to their rounded tops there is no nice way to stack them. Currently they sit in a cardboard box on the floor but it was a great excuse to wire up the Nintendo and give Pokemon Stadium and F-Zero X a go. Both bring back fond memories as they were staples of my gaming life during University, but it is oh-so strange returning to them. Not because of how they look, although their stretched visuals on a 40″ HD TV are anything but flattering, but because it was like catching up with a friend you haven’t seen for years and finding out that you still get on just as well now as you ever did. Ali and I were instantly sucked into Lickatongue’s antics in the food court, the speed at which F-Zero X throws you around the course and the general accessibility they still hold. True, there are some dogs in there but it goes to show that some games do hold the test of time. Tonight the rose tinted glasses will be tested against Mario Tennis, but I’m interested, what games have you revisited recently from your past and did they still stand up against the years? Back at university I used to play a reasonable amount of Real Time Strategy (RTS) games. Take five boys in one house, a few copies of Command & Conquer and a network held together by duct-tape and you’d keep me quiet for hours. Since then, unfortunately, I’ve moved further and further away from PC gaming. Consoles are now my platform of choice and the RTS genre doesn’t have a reputation of porting to them well. Several have tried to rectify this by building a console version from the ground up rather than trying to shoehorn PC controls onto a joypad. Lord of the Rings: Battle for Middle Earth did a reasonable job but still everything seemed overly complex and fiddly within its menu structure. Where Halo Wars works for me is the simplicity at which its build and actions menu operate with. There are no multiple depths, whenever you select a menu you a present with a single circular layout where all options are visible. There is no drilling down to unlock super secret powers, everything is a stick push and button press away. Obviously the amount of units and options available have been kept lean to fit within this structure, but as the UNSC and Covenant forces are already well established I don’t believe this is too its detriment. Adding too many outlandish crafts would have scuppered Wars’ connection with the greater Halo universe. What this aids is a rock-paper-scissor style battle where certain troops/vehicles/aircraft are better suited to taking down other troops/vehicles/aircraft than others. Should you pick the wrong one you won’t have to go through a giant tech tree to rectify your mistake as there are only three or four unit types in each bracket. Some may have misgivings about being limited to a certain number of buildings, which in turn limits your resource gathering and unit production. Each base only has a certain number of slots and players must choose how to fill them wisely as they only way to get more is to take over another base. It can seem that at times your army does seem dramatically small compared to what you need for the task in hand but at the moment I’m putting that down to my inexperience. 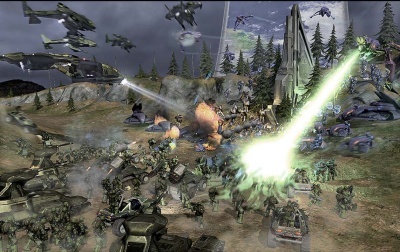 My main issue with Halo Wars was with the actual movement around the battlefield. The default settings seem far to twitchy and aiming to select a single unit can be troublesome. The solution seems to have been to tone down the sensitivity in the menus but compared to the spot on handling of the original Halo that experience was disappointing. In the time I’ve spent in the alpha and with the now released demo I’ve enjoyed myself and as a self-confessed Halo fanboy I’ve been surprised at the new units. They’ve managed to make up the numbers but without breaking the conventions of either faction; Covenant Locusts are hybrid between Scarabs and Wraiths whilst the UNSC heavy airsupport look as though Pelicans have been on the Weight Gain 3000. I do get the feeling this isn’t going to set the RTS world alight and that the Koreans won’t be discarding their Starcraft discs just yet, but Halo Wars does seems a solid if not exceptional RTS that should be worthy of most 360 owner’s time. Even if they can’t tell you Master Chief’s first name. “Maaaaaaaaaaaaaaaaaaaaaaaaaawwwwwwwwww!” For the umpteenth time this evening my purple alien cries out for his lost pet blob, Maw. Quite where he has gotten to is anyone’s guess; I last saw him eating tribbles in a bed of daisies. Some time ago we crashed on a strange alien world and it appears that our best way off it is for him to digest half of the world’s fauna, a task which his is excitably setting about. The Maw is a platformer come puzzler, quite reminiscent of Space Station Silicon Valley. You roam around the green and verdant setting, meeting the local wildlife and attempting to figure out how to break through the various barriers that block your escape. To break through your pet’s leash doubles up as a weapon, but in situations where that is not enough your pet itself proves useful. Like a gelatinous Kirby, consuming certain creatures will unlock special powers. Fiery salamanders will allow him to burn down trees, flying worms send him bobbing like a balloon whilst eating a peacock apparently turns him into a laser firing fiend. Each transformation brings out the character in Maw and it’s suprising just how much exists within a one-eyed blob. The challenge is getting each creature in a state where Maw can eat them, as those salamanders need to be cooled, worms grounded and peacocked plucked. Most of these are logical and shouldn’t stop anyone in their tracks for long, but do prove engaging none the less. There is a hint of Katamari, too. Early on Maw will only be able to snack on the smallest of creatures but the more he eats the larger he gets and the more prey available to him. Completists will scour the level for anything that moves and a few levels in they’ll have an eating machine, chowing down on anything that crosses their path. There really is only one word to describe The Maw, and that’s “nice: it has “nice” graphics, “nice” sounds, a “nice” concept, a “nice” charm about it and a fun factor that could be summed up simply as being “nice”. Unfortunately “nice” isn’t always enough. Maw is worthy of your time, if you want to gorge your way through a planet, but there is nothing exception or standoutish. It’s possibly why I’m so unsure about this review as there is nothing to damn it for yet equally to praise it highly for, either. Those taking a dip will find a smile inducing journey but there is very little reason to play through for a second time. From the highs of watching a great game of American Football last night I am brought back down to earth with a bump this morning when faced with our own domestic version of the beautiful game. The transfer policy at Spurs is now irking me. It seems as though we are on a mission to bring back to White Hart Lane everyone we have sold in the last twelve months. Defoe has been a welcome returnee but seeing Chimbonda waltz back in followed by the possibility of Keane makes me want to raise my arms to the skies and scream in protest. I can understand the mindset that would have seen Chimbonda as a required asset in our fight for survival but why we need another striker is beyond me. Defoe, Bent, Pav and Campbell are all doing reasonably well, even if Defoe is crocked, and another high profile player who will expect to play week in week out might rock the boat rather than stabilise our sinking ship. What those up front are missing, however, is supply. They cannot be expected to score if the ball never reaches them and Keane isn’t going to be any different. Keane was a wonderful servant to Spurs and I would love to welcome him back with open arms but I would also love to see the £15m put to better use. Still, I’m the bloke who thinks Zakora’s done alright for us this season.